The game focuses on the collaboration of a currently growing global community to progress an interactive storyline that asks players to assume both online and offline roles. Scavenger hunts, puzzle solving, and general discovery in The Lost Ring mystery is all part of the experience. Players around the world are given Tracksticks to create city-scale labryinths, known as "ompha labyrinths." 27 of these labyrinths are needed across the globe in order for participants to achieve their final goal. In the mythology of The Lost Ring universe, six people have woken up in a state of amnesia and are seeking the help of others in escaping the enigma of their situation, and possible existence in another realm. The creation of the ompha labyrinths is one of the many necessary steps towards fulfilling the cosmic theory of multiversal travel, an idea that it is possible to move between alternate states of reality. In order to do this, a "co-ordinated effort on planetary scale" is required in the making of every labyrinth across the world. In the spirit of omphaloi (an ancient system of navigation similar to GPS), trackstick. will record a player's movement through a city labryinth and show them their track on a satellite map. 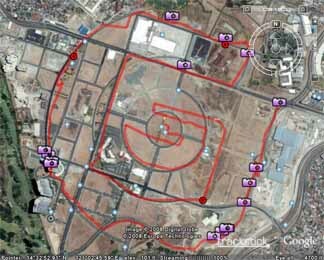 These tracks are made by teams composed of volunteers throughout each of the 27 cities, and participants are encouraged to set up relay points and use Trackstick like a baton, getting passed from one team member to the next. Instructions to make these labyrinths are provided by Lost Ring characters, like Eli Hunt, a historian investigating the mysteries of The Lost Ring and a guide to the progression of mission objectives. The ultimate goal of the game is unknown, but uncovering the truth of The Lost Ring is enough incentive for the many of those around the globe who have already started playing! The Lost Ring is a global immersive adventure. It's an alternate reality game — an interactive story you help tell, by piecing together clues online and in the real world. The game started in March 2008, and you can join any time. It's free to play, and easy to catch up on what's happened in the story so far. The Lost Ring is an adventure you experience with people from all over the world. As a global team, you'll work together to uncover a secret that's nearly 2,000 years in the making. Where does it all lead? To the 2008 Summer Olympics in Beijing, where players will join forces online and across the globe to help save the worlds. + Watch The Lost Ring trailers to catch up on the story. + Listen to The Lost Games podcasts to learn the legends of the Ancient Games. + And, if you're really hooked, check out the players' wiki to catch up on all the clues and latest discoveries.